Hi Friends: There is a new challenge today over at the Crafting When We Can Challenges Blog, where the current theme is Add Circles. Please visit our fabulous sponsor this week, Fabrika Fantasy, to see all of their wonderful products! Print image onto smooth white cardstock and color with Spectrum Noir markers. Add glitter brush pen to dress and lips, then add Glossy Accents and ultra-fine glitter to her wings. Die-cut the image with the stitched circle die and ink the edges. Die-cut patterned paper doily using the Celtic Fire Doily Die, ink edges, then back the image circle with it. Cut patterned papers to fit an A7 card base, ink edges. Emboss 1 inch strips with dots folder and rub the dots with the bronze wax paste. Adhere background papers to card base. Die-cut lace doily circle from coordinating patterned paper, cut in 1/2 and emboss with nested circles folder, then rub the raised areas with the bronze wax paste. Add doily panels to the card, then use craft foam to add dimension to the focal image and glue to center of card. Add ribbon bow with fancy brad in center. 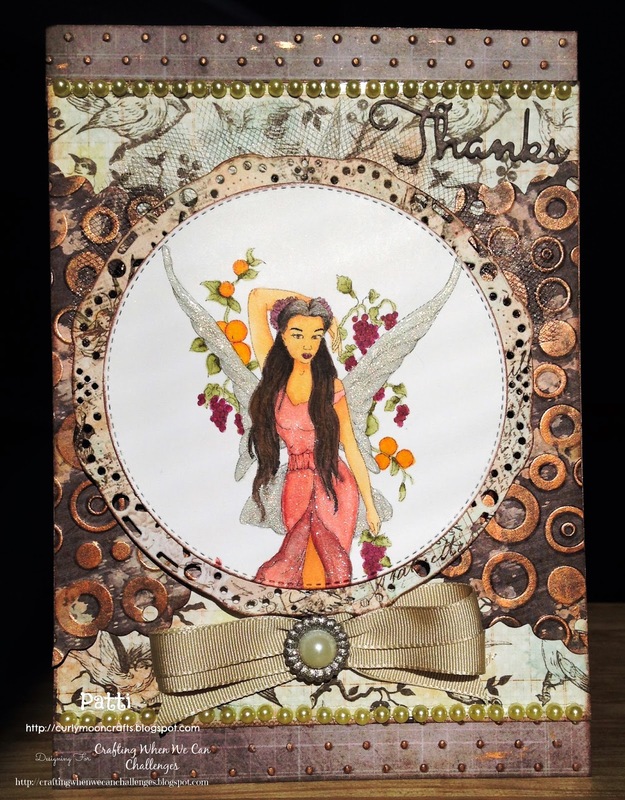 Cut "Thanks" sentiment using the greetings die and add to top of card. Finish with strips of gems at the top and bottom edges of the card.